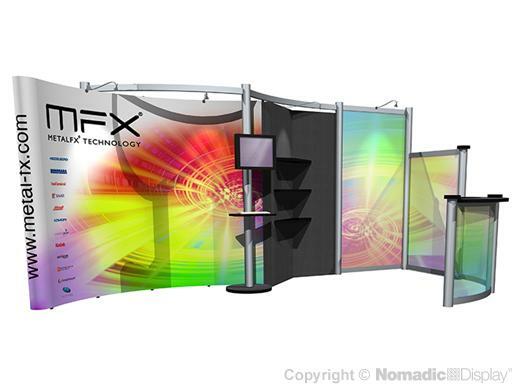 Bring your brand to life with Nomadic DesignLine trade show displays. Expect a lifetime of versatility with our 20’ hybrid display systems that are engineered to adapt and change to your market challenges. Our hybrid trade show displays blend the strengths of our most popular product lines into a power packed presentation. Our industry leading pop-up is backed by our "No Questions Asked" Lifetime Warranty. This display solution features a semi-private meeting area and an integrated A/V workstation. Previously known as Da Vinci and Nebula.